At a hotel bar in New York, there's a very luxurious drink. It's $176, is made up of expensive alcohol and is only around for a limited time. And it's called, the Quattroporte. Yeah, like the Maserati. As far as I can tell, the drink itself does not have four doors. 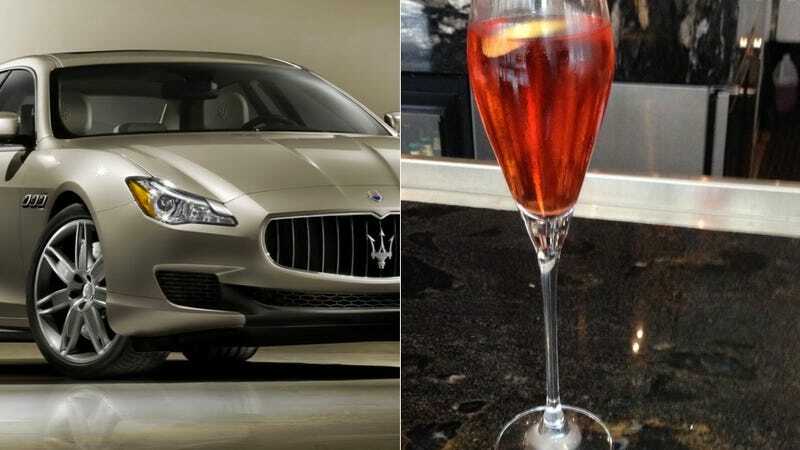 But according to Gothamist, the bar at the Langham Place hotel has decided that for your $176 drink, they'd give you a ride in a Maserati Quattroporte. Why $176? That's the top speed of the (slowest) new Quattroporte. Obviously. Before you rush down there, it's not exactly simple like a gin and tonic. OK, there is Plymouth Gin, together with Aperol, Amaro Nonino and Krug Champagne. Just take in all of that luxury (and color) in a skinny little flute. But after you've swallowed your pink drink and settled the tab, the hotel will take you anywhere in Manhattan in the Quattroporte. Just try not to get Quattroporte all over the backseat of their Quattroporte, if you follow me. Gothamist reports as of Tuesday the bar hadn't actually sold any, but there's still time. The Quattroporte is only available through November and requires 24 hours notice, because craftsmanship takes time. And the car probably needs to be clean, too.